Thursday 18. 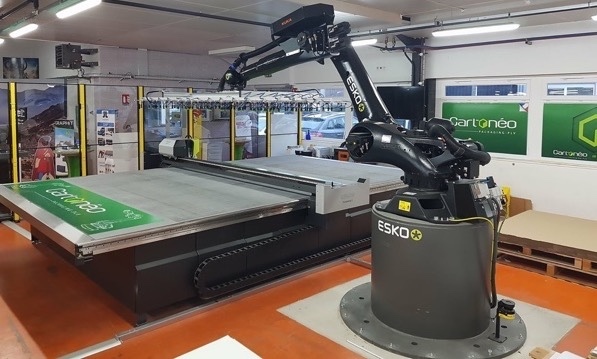 January 2018 - By investing in the Esko robotic cutting table, the largest on the market, the company is confirming its ambition to become a major player in the manufacture of POS materials. Cartonéo is a French company based in the Jura Mountains that specialises in the manufacture of point of sale (POS) and point of information (POI) materials from flat and corrugated cardboard. Its customers come from sectors such as the food, automobile, cosmetics, wine and spirits and pharmaceutical industries. The group’s plan is to further develop its POS business. To achieve this ambition, Cartonéo has invested in Esko production workflow automation and a Kongsberg C66, Esko’s largest robotic cutting table. This establishes the Cartonéo group as the first in the world to have this robust portfolio of solutions and equipment. The reason for this investment is simple: the market trend is for brands to differentiate themselves through customisation by producing small quantities of unique POS materials for special events and to customize materials by location. Cartonéo’s customers were also asking for POS materials made from thick cardboard or plastic, and there was no way the company was going to pass up this exciting new market opportunity. To respond to the new requirements, Cartonéo invested in an HP Scitex 11000 wide format printer. To increase customer loyalty and bring in new customers, Cartonéo had to ensure these new POS products could be manufactured within extremely tight deadlines and in small quantities. The only cutting table it could use to meet these challenges was the Kongsberg C66 from Esko. As a result of these decisions, the company now has a completely robotic production chain for the digital printing and cutting of small series POS materials. Even though the company is one hundred years old and based in a rural area, it is at the cutting edge of POS technology and now has a set-up that is unique in the world! It has come a long way, this small company from the Jura Mountains. The great grandmother of Edmond Perrier, the current Cartonéo Chairman, founded the company in 1897 in Saint-Claude, the pipe capital of the world. In its turn, the next generation wrapped wooden toys, another speciality of the region. At that time, Cartonéo employed about 50 people, and everything was done by hand. Perrier’s father ultimately moved into corrugated cardboard in the 1950s. Perrier has led the company since 1991. It was his decision to equip the workshop to include offset printing and lamination. Today, the Cartonéo group has three locations and employs about 130 people. To optimise production even more, the Kongsberg C66 is configured for multi-area production. While one area of the table is in action, the robot is managing the other area by taking out the finished part and loading a new sheet. Work switches between areas automatically. Another benefit is the i-cut production console (iPC) connected to the device manager for remotely monitoring production progress. Operators can prepare one job while producing another, which increases efficiency even further. The i-cut production console can also be used to estimate cutting time according to the characteristics of the job; this enables more efficient planning. “Production workflow automation, together with the Kongsberg C66, has increased our productivity considerably because we can produce continuously and create a workflow that’s really industrial. Working time that was previously spent on numerous manual operations has been transferred to tasks with high added value,” adds Laurent Gangloff, Cartonéo Industrial Director. “Thanks to the exceptional size, speed and precision of the cutting table when operating on sturdy rigid materials, Cartonéo can now take advantage of the numerous opportunities offered by the growth in the POS market. Digital production is a new development for us; this is why we are taking the time to learn all the tricks of the trade in partnership with Esko,” Perrier explains. Frank Adegeest, Esko R & D director, recalls, “The first discussions started in late 2015, when Cartonéo wanted to acquire a large format cutting machine to work with the HP Scitex 11000. Requirements included maximum automation and continuous production. 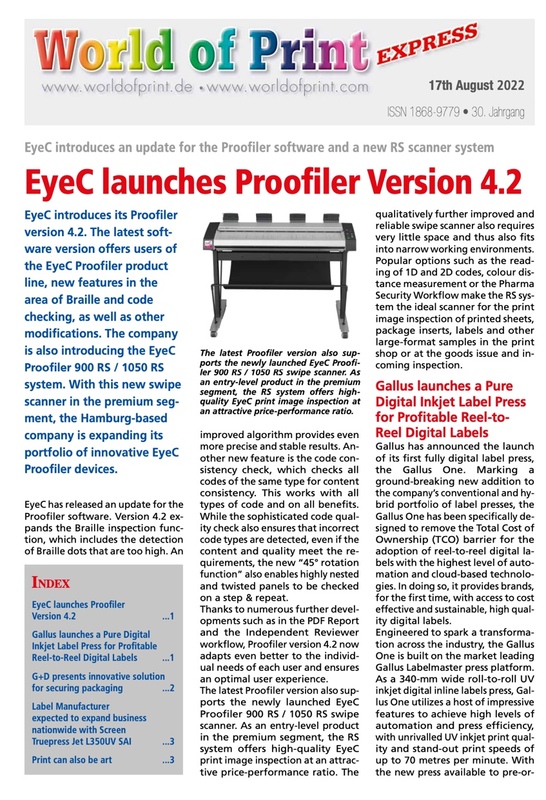 We had a plan in mind, but the necessary product wasn’t on the market yet and would not be available for another 6 months, at drupa 2016. After various discussions and the signing of a confidentiality agreement, Cartonéo committed to buying a solution that was still only in the design phase. So Cartonéo became Esko’s alpha site, and then beta site. Clinchtech, a software development company specialising in automation, and the team that installed the HP Scitex 11000 press were also involved.” Twelve months later, in March 2017, the final version of the Esko Kongsberg C66 table was installed at Cartonéo. “We can now cut a wide range of new materials such as plastic or very thick cardboard, which means that we can produce honeycomb or triple wall corrugated products, and even make cardboard furniture. We are beginning to grow in these markets, which are new for us; and we have already signed several contracts as a result of these new capabilities,” Perrier concludes. In short, the investment is paying off, and Cartonéo is writing a new chapter in its long and storied history. Digitally controlled LED UV exposure system makes flexo plate production simple, consistent, and automated.